Wanda Jackson, known to many as the First Lady (or Queen) of Rockabilly, recently caught my eye after I read that Jack White has produced her latest album (due out later this month). I loved the work he did with Loretta Lynn a few years back, especially the song, Portland, Oregon, so I was game. The album boasts covers of "Shakin' All Over" as well as the Amy Winehouse song, "You Know I'm No Good". These two cuts alone are worth the price of the album. Jackson made a name for herself as an early female rockabilly singer and is considered to be a rock and roll pioneer. When rockabilly fell out of mainstream fashion, she adapted and made a comfortable career for herself in traditional country music. She's a member of both the Rockabilly Hall of Fame and the Rock and Roll Hall of Fame. Frankly, anyone in their mid-70s who has enough moxey to work with Jack White and cover Amy Winehouse gets props in my book. "Hard Headed Woman", written by Claude Demetrius, is best known as an Elvis Presley song from his 1958 film Kid Creole. However, Jackson recorded it that same year, making her version not quite a cover. So while it may never be considered "her" song, I think she does a great job. And simply because I'm feeling the love (and probably because this is my favorite Wanda Jackson song) here's a second Jackson tune for you. "Funnel of Love" was recorded in 1961. I think you can definitely hear some early rock and roll undertones here. What do you think? Which one do you prefer? I like Funnel of Love. I love the trippy far east feel to it and yes, it does have some rock and roll undertones. Calling by from Italy via Australia to listen to your Sunday Song Selection, better late than never. I usually do the rounds on Sunday morning with my coffee. I must have missed this one while I was away, so glad I called by to enjoy it today. Looks like it's unanimous and Funnel of Love is the winner! 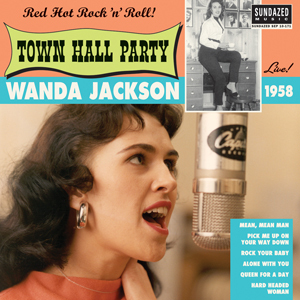 Another educational post for me too as I have not heard Wanda Jackson sing before. Hope you will be back on Sunday with another romantic tune!